Invoice Finance Scotland was formed, and continues to be owned to this day, by two invoice finance experts, boasting over 25 years of experience across the accounting, banking, finance and recruitment sectors. We are proud to have assisted thousands of businesses, ranging from new start-ups to PLCs with £50 million turnovers, to generate finance, acquire, and even disposing of their business. For us, the devil is in the detail, which we believe gives us our competitive edge over other independent finance companies, accountants, brokers and third party intermediaries. Our ethos involves the investment of our time so we can really understand your business and the issues you need to resolve; we scratch way beyond the surface. It is by doing this that we are able to identify the most relevant and tailored solutions to your problems, thus minimising the time and resources required for a successful solution. Furthermore, we remain committed to you long after deals have been done, with on-going guidance and support befitting your continuing financial needs moving forward – and the great news is, it won’t cost you a penny for this! We are naturally delighted that in excess of 95% of our clients confidently recommend us. 1. Speed – from the initial point of contact, we remain very aware that time is of the essence. We aim to move things along quickly on your behalf, rather than in fits and starts. Yet we couple speed with clear and concise communication, keeping you informed about both good news, and bad news, with haste and transparency. We maintain the highest levels of communication throughout all transactions. 2. Flexibility – Due to the access we have to the widest spectrum of potential financial solutions, our flexible services are as long as they are wide. We are able to secure funding on freehold premises, outstanding invoices, machinery and plant, and stock. We additionally offer clearing facilities and Enterprise Finances Guarantees. 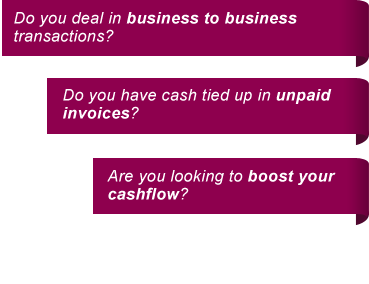 Our lending pool is vast, enabling us to creatively generate optimum cash amounts. This versatility affords us the commercialism and pragmatism that is sometimes lacking in other financial advisors, who find it preferable to use only one lender per deal. This method saves them time, and, whilst it might secure a deal fast, it might not be the most client-centric one. 3. Surety – our commitment to speedy action is backed up by equally speedy closure. The great relationships that we enjoy with funders assure that they return our calls fast, and give us answers fast, whether positive or negative ones. If one door closes, we are presented with the opportunity to immediately knock at others on your behalf. It is noteworthy that we fall in to the SME category ourselves. We keenly champion other SME businesses and have first-hand experience of the financial issues they face. We receive regular client referrals from reputable accountancy practices, as we deliver each and every time, without impinging upon the independence of our clients. As active members of the National Association of Commercial Finance Brokers, we adhere to its code of conduct, offering you any additional assurance you might need that we offer high quality and reputable service amidst a largely unregulated sector. Talk to us and discover more..